As College Station’s streets have become increasingly congested, accidents involving pedestrians and motor vehicles have resulted in scores of injuries and several tragic fatalities. It’s a scene becoming all-too-familiar, not just here, but across the country. According to the National Highway Traffic Safety Administration, pedestrian fatalities have surged by 46 percent since 2009. While other types of traffic fatalities declined, the national pedestrian death toll spiked to almost 6,000 in both 2016 and 2017 — the highest levels in more than a quarter-century. Our state suffered the third most pedestrian deaths in the nation last year. 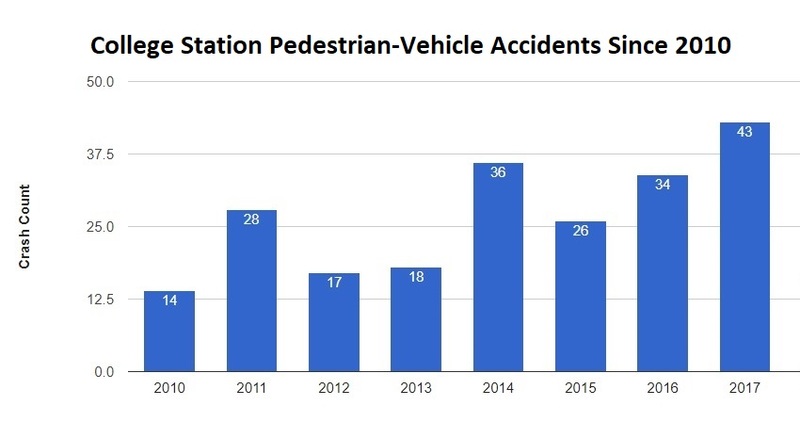 In College Station, the number of vehicle accidents involving pedestrians has more than tripled since 2010, when we only had 14. From 2010-2013, we averaged about 19 pedestrian accidents per year, but from 2014-17 that average skyrocketed to almost 35. We’ve already had 21 such accidents in 2018, as well as our ninth pedestrian fatality since 2010. From 2010-17, College Station had 232 vehicle crashes with pedestrians. 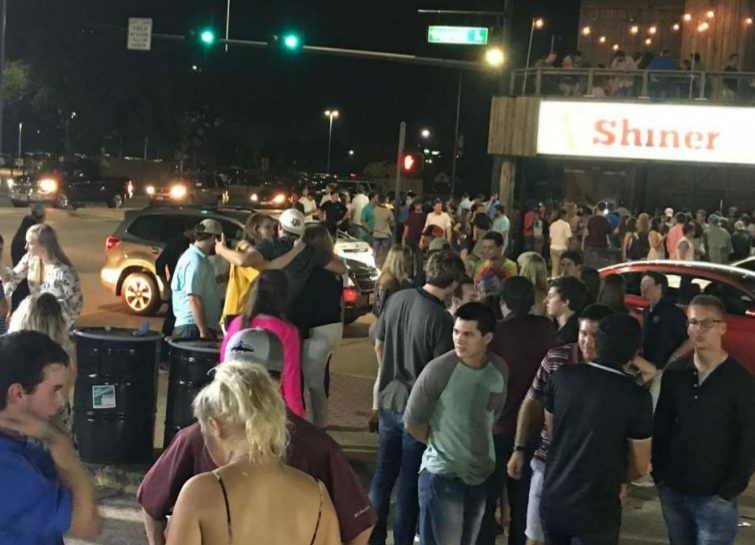 Although only 17 occurred on the Texas A&M campus, the vast majority happened on nearby city streets. Nationally, more than 75 percent of pedestrian accidents happen at night, with most occurring on city streets and frontage roads. Only about 18 percent happen at intersections, which means people are trying to cross busy streets at other points without using designated crosswalks. The pedestrian-related accidents we see in College Station are typically caused by failure to yield, distractions, speeding, population growth, and alcohol and drugs. The most common cause of pedestrian accidents in College Station is a failure to yield by either the motorist or the pedestrian. 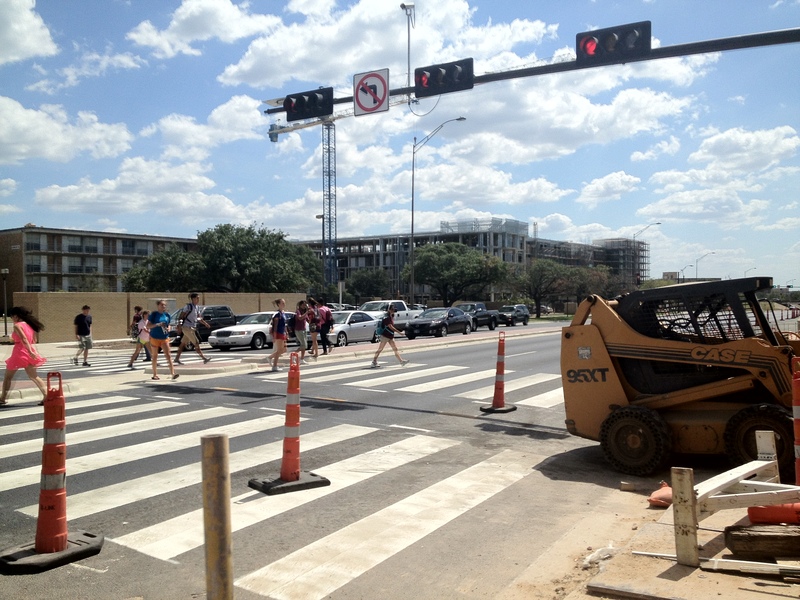 On the A&M campus, vehicles must yield the right-of-way to pedestrians at all times. Off-campus, vehicles must yield to a pedestrian in a crosswalk or one close enough to the road to be in danger. Cars or trucks emerging from an alley, building, private road, or driveway must yield the right-of-way to pedestrians approaching on a sidewalk. Pedestrians have a responsibility, too. They can’t suddenly leave the curb and enter a crosswalk in the path of a moving vehicle that’s unable to yield. Pedestrians must also yield the right-of-way when crossing outside of a marked crosswalk or an unmarked crosswalk at an intersection. At an intersection with a traffic control device, pedestrians may only cross between two adjacent intersections in a marked crosswalk and may only cross an intersection diagonally if authorized by a control device. College Station has added about 25,000 residents since 2010. That means we have thousands more cars – and pedestrians — on our roadways. The rapid growth is expected to continue. Distracted driving is a well-documented problem, but distracted walking can be just as hazardous. The likely source of these distractions? Smartphones, of course. The number of smartphone users in the United States skyrocketed from about 62.6 million in 2010 to an estimated 237.6 million this year. We see an increasing number of oblivious pedestrians with their eyes glued to their cell phones, some multiplying the danger by using headphones or earbuds. These types of distractions may be the most significant factor behind the recent rise in pedestrian accidents. The impact of alcohol and illicit drugs can never be underestimated. Alcohol and drugs impair judgment, decision-making, and reaction time. Most people recognize that it’s dangerous to drink and drive, but walking while drunk can be equally risky. The Governor’s Highway Safety Association reports that a third of pedestrian fatalities involve a walker whose blood alcohol level exceeds the legal driving limit. A recent study by the American Automobile Association showed the risk of pedestrians being involved in a crash climbs substantially when vehicle speed rises by even a small amount. About half of pedestrians die when the vehicle is going 42 mph, three-quarters perish when the car or truck is traveling 50 mph, and 90 percent die when vehicles reach 58 mph. Follow the rules of the road and obey signs and signals. Walk on sidewalks whenever they are available. If there is no sidewalk, walk facing traffic and as far from traffic as possible. Keep alert at all times; don’t be distracted by electronic devices that take your eyes and ears off the road. Cross streets at crosswalks or intersections whenever possible. This is where drivers expect pedestrians. Look for cars in all directions – including those turning left or right. If a crosswalk or intersection is not available, locate a well-lit area where you have the best view of traffic. Wait for a gap in traffic that allows you enough time to cross safely, and continue to watch for traffic as you cross. Avoid alcohol and drugs when walking; they impair your abilities and judgment. Look out for pedestrians everywhere at all times. Use extra caution when driving in hard-to-see conditions, such as nighttime or in bad weather. Yield to pedestrians in crosswalks and stop well back from the crosswalk to give other vehicles an opportunity to see the crossing pedestrians so they can stop, too. Follow slower speed limits in school zones and in neighborhoods where there are children present. Be extra cautious when backing up – pedestrians can move into your path. Pedestrian safety is a responsibility shared by drivers and walkers. By making good decisions and paying attention, we can significantly reduce the number of pedestrian accidents on our streets. Lt. Craig Anderson is in his 31st year with the College Station Police Department. Before becoming a police officer, Craig served four years in the U.S. Navy. If you’ve ever driven through the Northgate Entertainment District on a Friday or Saturday night, you know it’s an immensely popular place for college students to get revved up for Aggie football or just unwind after a long week of classes. You also know it can be an extraordinarily dangerous place for unwary pedestrians. With more than 60,000 students walking, driving and bicycling around campus, safety has to be the top priority for local authorities. The city has worked closely with Texas A&M and The Texas Department of Transportation to devise and implement various safety improvements along University Drive. In 2012, Old College Main was closed at University Drive, and we added a bicycle and pedestrian crossing. Still, with one of the nation’s most populous universities across the street, pedestrian safety remains a dominant issue – especially at the intersection of University and Boyett Street. Despite the presence of a signalized crosswalk, many pedestrians blatantly ignore the signal and haphazardly move through the bustling traffic. Meanwhile, ride-booking services and taxis often stop in traffic lanes to serve their customers. We may not be able to stop that reckless behavior, but we can try to reduce the risk. 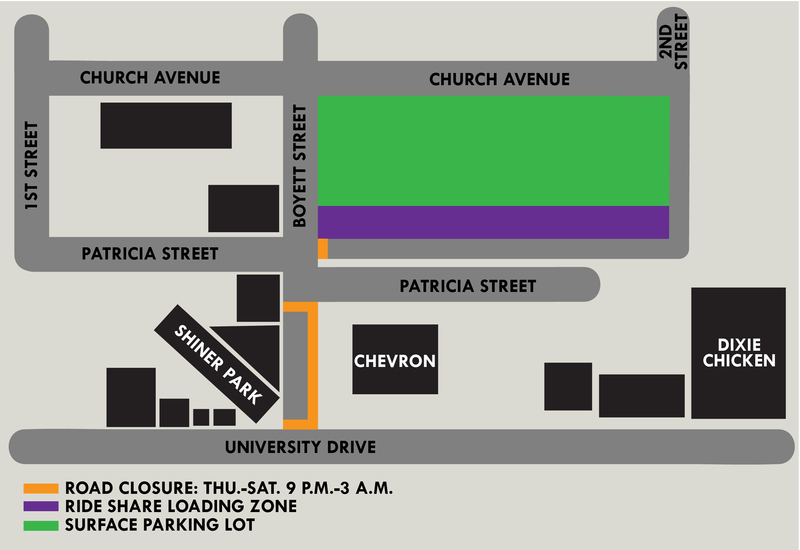 That’s why starting this week, Boyett Street will be closed between University Drive and Patricia Street from 9 p.m.-3 a.m. on Thursday, Friday, and Saturday nights. The intersection will also be closed Wednesday, Aug. 29, the night before the Aggie football opener against Northwestern State. No parking will be allowed on the sealed portion of Boyett. The closure includes the area in front of Shiner Park, O’Bannon’s Tap House and a few other bars, along with two entrances to the corner convenience store. Whenever Boyett is closed, the southern row of the Northgate parking lot will serve as a designated loading area for ride-booking customers. To help traffic flow, we renumbered and restriped the lot to accommodate angled spaces. Plenty of additional parking is available in the city’s Northgate Parking Garage, which has more than 700 affordable spaces. These adjustments may be inconvenient for some, but in the end, we’ll have a safer, more pedestrian-friendly environment in Northgate. Gus Roman has been with the City of College Station since 2015 and has served as assistant director of community services since 2016. 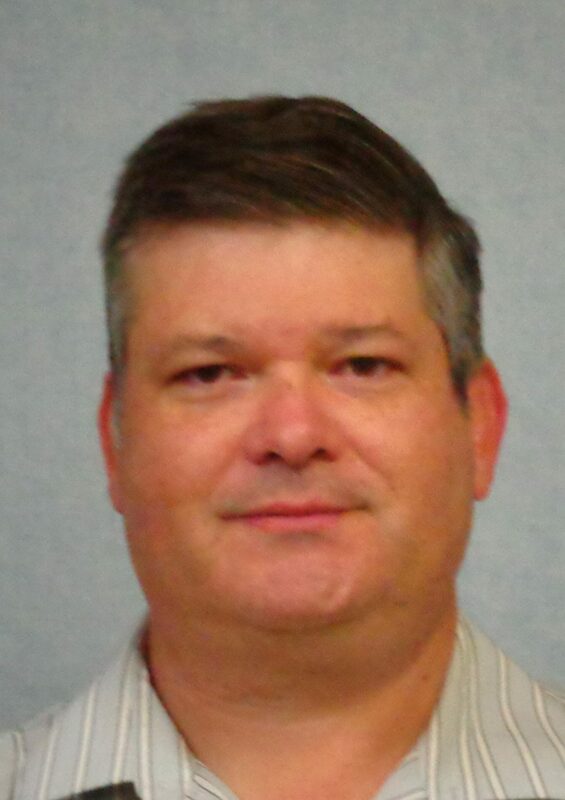 He’s also worked for the City of San Marcos and the City of Bryan. Gus previously served the City of College Station from 1995-2003. He has two degrees from Texas A&M – a bachelor’s in building construction (1989) and a master’s in agriculture, land economics and real estate (2006). Welcome to our live blog from the College Station City Council’s workshop and regular meetings on Thursday, May 24. It’s not the official minutes. The workshop has started. Mayor Karl Mooney is absent tonight. Mayor Pro Tem James Benham will preside. No action was taken out of executive session. The council heard a presentation about temporary measures to enhance pedestrian safety in the Northgate area, including the closing of Boyett Street at University Drive on Thursday, Friday and Saturday nights. An ongoing comprehensive study will help determine permanent changes. The council unanimously approved $25,000 in College Station Hotel Occupancy Tax (HOT) funds per year to support the Brazos County Expo Center’s bid to host the Texas State 4-H Horse Show for the next five years. Other possible funding partners and their annual HOT fund commitment are Experience BCS ($35,000), the City of Bryan for ($25,000) Brazos County ($50,000), and Expo Rewards Program ($12,000). The combined commitment for all partners is $147,000 per year for a total of $735,000 over five years. The Texas State 4-H Horse Show is an eight-day event in July. The Abilene Convention and Visitors Bureau estimated an economic impact of $887,400 and 1,416 room nights for the 2017 show in Abilene. For the 2019 event, Experience BCS estimates an economic impact of $809,884 with 2,000 hotel room nights. Mayor Pro Tem Benham adjourned the workshop after the council discussed its calendar and received committee reports. The regular meeting will start immediately. The president of the Woodland Hills Homeowners Association spoke about maintaining the trees as a buffer between the subdivision and Lowe’s. A resident spoke about issues with development in her Woodlands Hills neighborhood. A resident spoke about the importance of trees and green areas in maintaining a healthy environment. Renewal of a contract with the Texas Department of State Health Services, Vital Statistics and a data use agreement for access to confidential information. The $135,814.39 purchase of new grounds maintenance equipment from Professional Turf Products for the Parks and Recreation Department. The Semi-Annual Report on Small Area Impact Fees and System-Wide Impact Fees for Water, Wastewater, and Roadway. A three-year, $1.2 million contract with SEL Engineering Services for electrical engineering services. An ordinance repealing and terminating the Medical District Tax Increment Reinvestment Zone. A $600,000 real estate contract for property for the planned Fire Station No. 7. 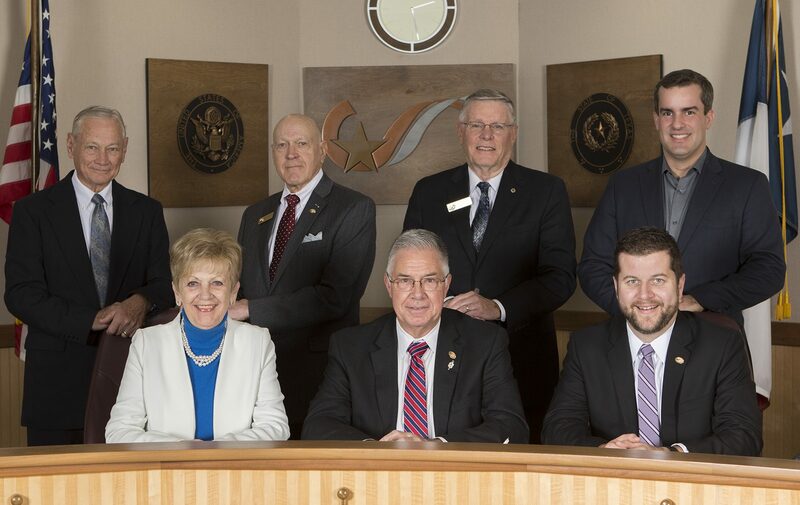 The second restatement of the inter-local agreement with the City of Bryan, City of Brenham, Brazos County, Washington County, Texas A&M University, and Grimes County for the construction, acquisition, implementation, operation, and maintenance of the Brazos Valley Wide Area Communications System. A $337,182.47 general services agreement with ASAP Security Solutions for a video surveillance system in the Northgate District and in the Northgate Parking Garage. After a public hearing, the council unanimously approved a $4.13 million amendment to the city’s FY18 budget. Most of the amendment covers Phase II of the Veterans Park & Athletic Complex Build-Out ($1.55 million), the Fun for All Playground ($1 million), a design contract for Southeast Park ($400,000), and land for a new fire station. After a public hearing, the council unanimously approved a request to change the zoning designation from Planned Development District and Suburban Commercial to Wellborn Commercial for about four acres at the intersection of Wellborn Road and the future Royder Road. After a public hearing, the council unanimously approved a request to change the zoning designation from Rural to Wellborn Commercial for about 4.4 acres south of the Wellborn Road-Greens Prairie Road intersection. After a public hearing, the council unanimously approved the College Station Business Center Development Plan, formerly known as the Spring Creek Corporate Campus.The Spring Creek Local Government Corporation will work with staff to implement the next phases of the Business Center, including platting, infrastructure design, deed restrictions, development standards, naming, signage, and branding. The plan includes the development of about 250 acres of city-owned property along the east side of State Highway 6 South, north of W.D. Fitch Parkway, and south of Lick Creek. The city began purchasing property in the area almost 20 years ago for the eventual development of a business park. The city owns about 485 acres, including significant areas of preserved greenway. The council’s Economic Development Committee and the Spring Creek Local Government Corporation have jointly overseen the development plan process. Mayor Pro Tem Benham adjourned the meeting. The council meets again on Thursday, June 14. Northgate Pedestrian Safety: The council will hear a workshop presentation on proposals for temporary measures to enhance pedestrian safety in the Northgate area, including the closing of Boyett Street at University Drive on Thursday, Friday and Saturday nights. An ongoing comprehensive study will help determine permanent changes. Fire Station No. 7 Property: As part of the consent agenda, the council will consider a $600,000 real estate contract to purchase about four acres on Wellborn Road for the city’s seventh fire station. The item is part of the budget amendment on the regular meeting agenda. Northgate Video Surveillance: Also on the consent agenda is a $337,000 general services agreement with ASAP Security Solutions for the first phase of a video surveillance system in the Northgate District and Northgate Parking Garage. FY18 Budget Amendment: After a public hearing, the council will consider a $4.13 million amendment to the city’s FY18 budget. Most of the amendment covers Phase II of the Veterans Park & Athletic Complex Build-Out ($1.55 million), the Fun for All Playground ($1 million), a design contract for Southeast Park ($400,000), and land for a new fire station. Rezonings on Wellborn Road: After public hearings, the council will consider requests to rezoning two properties along Wellborn Road south of Greens Prairie Road to allow for commercial development. One is for about four acres, and the other is for 4.4 acres. Few things are more frustrating than getting caught in congested traffic, especially when it’s caused by inconvenient construction projects. 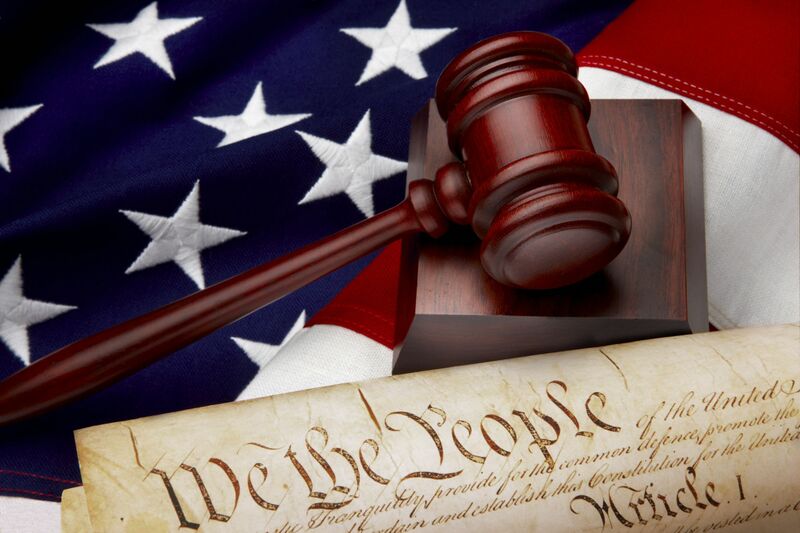 However, when the dust eventually settles, the benefits of these necessary projects quickly become evident. That’s certainly the case with the University Drive Pedestrian Safety Project, which will greatly enhance the safety of students and other pedestrians in the Northgate area. For more than three years, the City of College Station has worked closely with Texas A&M and the Texas Department of Transportation on the project. Thankfully, the first phase — which stretches from Wellborn Road to Tauber Street – is expected to be finished in the next two weeks. Pavers are being installed on the new College Main Plaza, and traffic control devices will be removed in the next few days. Next week, retractable bollards will be installed at the College Main-University and College Main-Patricia Street intersections, along with new pedestrian signals at Boyett and University.